My husband’s birthday always lands on Memorial Day weekend. This year he was supposed to be out of town working, but through a strange twist of fate he ended up coming home early and was able to celebrate his birthday with the family. I felt pressure to deliver on this momentous occasion, so I tapped into my adventurous side and decided on a day trip through the Texas Hill Country to Wimberley. I had never been there, but I heard they had a cute downtown area and an amazing park complete with a natural swimming hole–the Blue Hole (they call it a Texas treasure). My idea passed with the group, so we packed our lunches and bathing suits, slathered the kids in sunscreen and hopped in the car. We left Austin around 11:00am and reached Wimberley just before noon. I was excited when we got to town and drove down Old Kyle Road. I tried to convince my fellow carpoolers that we should get out for a quick look at the cute shops and antique stores, but they had another idea in mind: lunch and swimming! Thus, we forged ahead to Blue Hole Regional Park and spread out our picnic blanket on the plush grass running alongside Cypress Creek. I was pleasantly surprised that even on a holiday weekend the park wasn’t too overrun and totally manageable for our family of five. The crowds were tame and seemed to have a general respect and appreciation for the beautiful parkland. Even the teenagers dangling from the tree swing weren’t too frightening (haha). 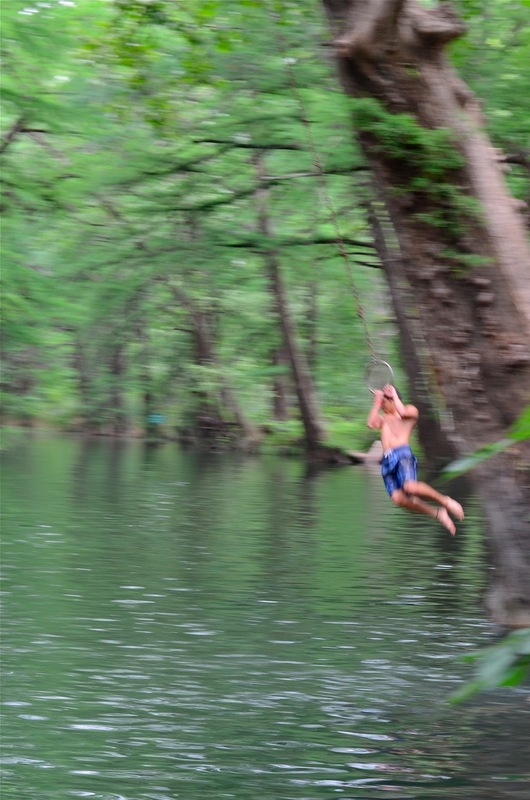 Blue Hole Regional Park is exactly 56 minutes from our home in Central Austin. The park is open year-round, and the swimming area is open May-September. Daily admission for the swimming area is free for children three and under, $4 up to age 12 and $8 for adults. There are also season passes available and an upcoming summer concert series the weekend of June 7th. Check the Blue Hole website for more information. About Sarah W: Mom, blogger, coffee maker, chauffeur, housekeeper, event planner, team photographer. To read more about how I make it through the day with a traveling husband and three toddlers visit The Sassy Shack.